The collection of various South African tribes has made the country what it is today. We will be having a look a some of the major tribes in South Africa which we have listed below. This is one of the top tribes of South Africa. History has traced their origin to patriarch Zulu, the child of a Nguni chief who lived in the Congo basin. Migration to the south began in the 16th century, where they eventually settled. Shaka who was their king formed a great kingdom and organised his nation in a very hard and military way. He also made a large army and armed them with shields and assegais to help them prevent the Dutch and British from taking over. After Shaka’s death, the Zulus were overtaken and forced to work in the white peoples’ mines. This South African tribe often live in ‘homelands’ based in Ciskei and Transkei. The Xhosa tribe came wandering from the north hundreds of years ago. They are known for keeping animals and story-telling. After the whites took over, Xhosa people were subjected to work on their lands as slaves. This led to many conflicts until when the white rule finally ended and the people regained their lands. Venda hailed from the north just as many other South African tribes. They then settled in Soutpansberg Mountains where their capital known as D’zata was built. The Venda people occupied the largest area which was rich in vegetation and mountains influencing more people to speak their language. The Vendas perform some rituals, which are still kept a secret to other people and they have some mystic legends too. This tribe came into South Africa during the 14th century. Their spoken language is known as Sechuana, which is a Bantu language. In the year 1820 however, the Tswanas were chased away by the Matabele people whereby they became ruled by British and the Boers. Till today, the Tswanas have been living in great villages called kraals. In the villages, there is a hierarchy ruling where all local chiefs gather under their coordinating king who rules them. The Tswana are a peace-loving people and they consider the rain as an important being to them. The Hottentots have many similarities with the Bushmen. They almost have the same culture, language and look. Hottentots mostly call themselves ‘Khoi’ and Bushmen call themselves ‘San’. When they come together, they are referred to as the ‘Khoisan’ or ‘Khoikhoi’ people, which is because of their clicking sounds. They also have a lot in common with other tribes in Eastern Africa, for instance. The Hottentots are not a big community, hence, they have been mixed up with other people in South Africa. The Sotho people came wandering from the north just like other tribes and later spread over central South Africa. 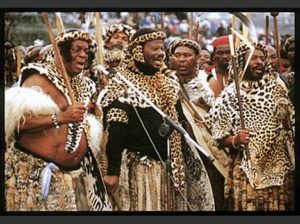 Basotho nation was then formed by King Moshoeshoe in the 18th century, which till today has remained united. Their language is related to Setswana and Sepedi. This tribe is classified under the sub-group of the amaXhosa. They are a Xhosa speaking group of people who gave their name to Pondaland, the area that comprises the Northern Seaboard of the Eastern Cape Province. The Swati is also known as the Swazi and they are the only South African tribe that has maintained their unique identity to date. They wear colourful traditional dresses and are known for its patriarchal nature. For them, selecting a king is like selecting the next queen mother who dominates the kingdom. They have retained their traditional beliefs in sorcery, witchcraft and traditional healing despite having accepted Christianity. They are known for their various traditional events, the Umhlanga, incwala and the most exciting – the eight-day reed dance. In the Tsonga culture, a village may be formed as a result of one family since a man was allowed to have many wives and children. They worship the Supreme Being Tilo and the men were naturally considered as the alpha. The Pedi is known as the Northern Sotho speaking nation. They initiate boys at an early stage and girls were given initiation necklaces by their admirers to serve as a rite of passage. The teenage girls and women would wear their hair worked up in a circular matted cup and leave their breasts uncovered until the time of marriage to show respect.